During Sunday and into Monday a big thaw set in across the Highlands causing significant melting of what was very extensive and deep snowcover. However, with the temperatures plummeting again on Tuesday the snowpack had consolidated and the avalanche hazard was low. This was combined on Wednesday with the promise of sub-zero summit temperatures, very little wind and bright sunshine. Forecasts don’t come any better and with the day free I decided to go for a day’s personal mountaineering with Ben the dog. 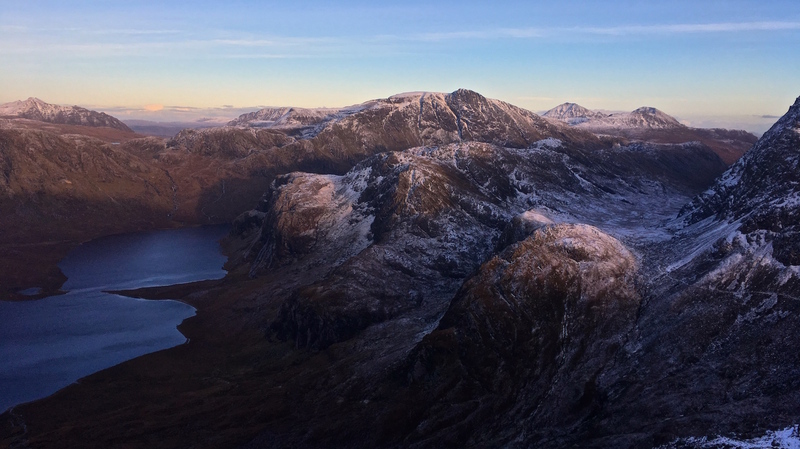 We headed northwest to Inchnadamph to tackle Ben More Assynt and Conival, hills that I’d visited a couple of times before, but never in winter. As we headed north and west we were treated to amazing views of all the hills. An Teallach looked particularly good, but the view of Ben More Coigach was really special! Setting off around 9am we followed the path up Gleann Dubh. I always enjoy walking through the limestone geology of the glens around Inchnadamph as it is so unusual for Scotland. The nearby Traligill caves offer a way into one of Scotland’s only extensive cave networks. A good path leads up the glen before becoming a bit boggier as it turns to head up to the bealach between Conival and Beinn an Fhurain. It was a glorious morning and, while frosty underfoot, the heat of the sun was making it hot work heading uphill. Any snow was rock solid though after the recent freeze and as I headed into the shade near the col the temperature dropped noticeably and the snow cover became more continuous. I put my crampons on at the col and then headed on steeply up slopes of neve to the summit of Conival, with breathtaking views opening up all around. There were a lot of surface hoar cystals on the snowpack all the way. A clear sign of the calm, cold conditions and lovely to look at but potentially they pose a future avalanche hazard should snow fall on top of them before they are destroyed by wind or warmer temperatures. I reached the summit around 12 noon and stopped for some lunch. It was a bit chilly but with my synthetic belay jacket on and almost no wind it was pleasant to sit and survey the scene over the peaks of Assynt and down to Wester Ross. To the north the peaks of the Reay Forest, Ben Hope and Ben Klibreck were all visible. A bit of cloud brushed the tops but the visibility was only temporarily obscured and I headed on over to Ben More Assynt, enjoying easy walking along the high ridgeline with dramatic, wild corries falling away on both sides. Atop Ben More Assynt I could look out over the whole length of Loch Shin and survey the area of the Lairg Asteroid Crater and the Central Sutherland Crater Walk. It was very satisfying to look down over the area after walking all around it this time last year! Having Ben with me I reckoned the best course of action was to retrace my uphill route back to Inchnadamph, so I followed the ridge back over to Conival. I stopped again at the top of Conival to drink in the views once more. The low winter sun was starting to set and was casting amazing light and shadows over the landscape. It was an almost endless array of familiar peaks with a view right down the length of Loch Assynt and some considerable time past before I could drag myself away. But with time marching on and a dog that was getting a bit restless in the cold, down I went, enjoying the last of the light. The snow had softened considerably below the height of the col and it was quite hard going for the first few hundered meters of descent here with soft snow over boulder fields, interspersed with boggy ground. Once in the glen again I picked up the path and the going improved once more, making for an straightforward, if long, walk out to the car watching the moon coming up and the first stars starting to twinkle in the night sky. I reached the car just as darkness was fully starting to set in. As I changed my boots with the constellation of Orion straight overhead you could feel that it was going to be another cold night. Being out in the mountains of the northwest with the whole place to ourselves and in such amazing conditions was an absolute privilege. With the conditions looking set to continue with a calm, stable easterly flow over the country, here’s hoping for a few more days like that before the season is through!